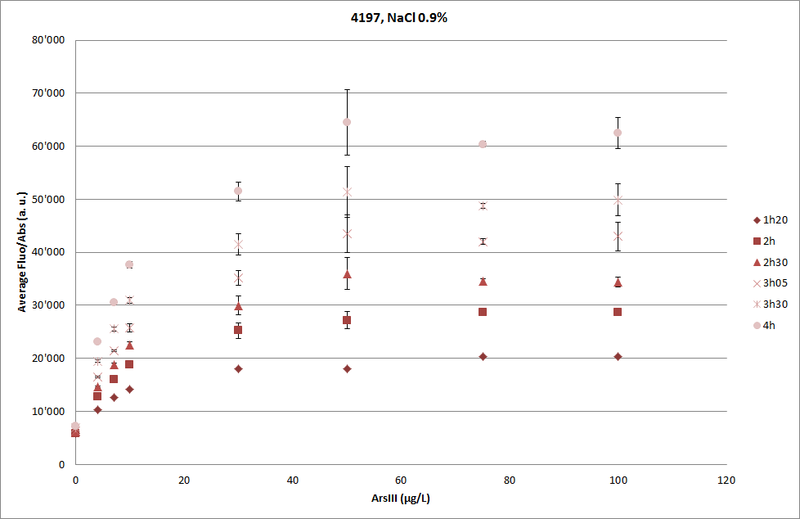 By analysis of the results, we can say that the GFP is more expressed in a NaCl solution than the other solution, so it means that the field where we’re going to take the tested sample has a real impact on the validity of our results. Furthermore, it appears that the 4197 strain seems to express more GFP than the 1598 strain.This results should be taken in account in a future measurement. At the end of the Arsenic assay results, we can see some graphs where we have the fold induction on the y-axis. 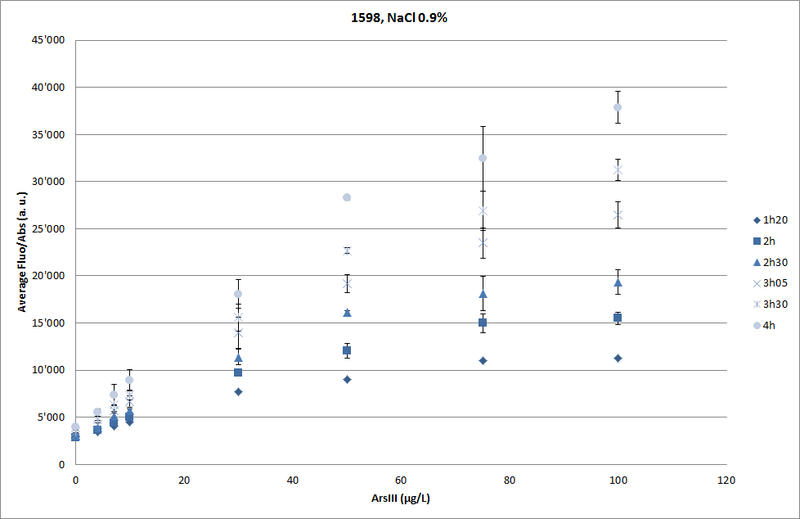 This value corresponds to the ratio of the absorbance in time t over the absorbance of the initial sample (t=0). We learned that bacteria expressing GFP need a medium (nutrients, etc… contained in MOPS buffer) to grow.The interesting thing is that the bacteria can be conserved at ambient temperature for a day. Also, to slow down its activity and store it, we can decrease the temperature of the sample to 4°C. We can imagine the following scenario: one can store the bacteria sample in the lab’s fridge for conservation and when you want to go to the field, you can take your sample out of the fridge and use them for a whole day at ambient temperature in the field. We also discussed the confinement of the GMO. After seeing, the vial used by ARSOlux, we decided to use the same kind of via for our project. 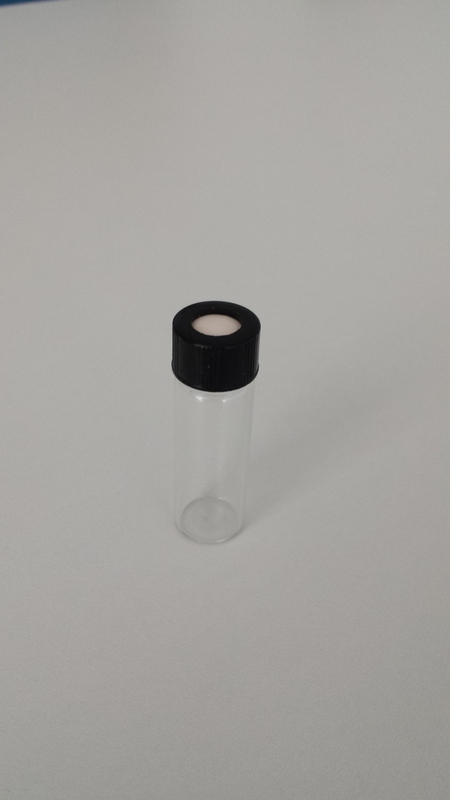 This vial has a peculiar cap that allows the injection of the tested water, via a syringe, into the bacteria containing vial without contaminating the environment. 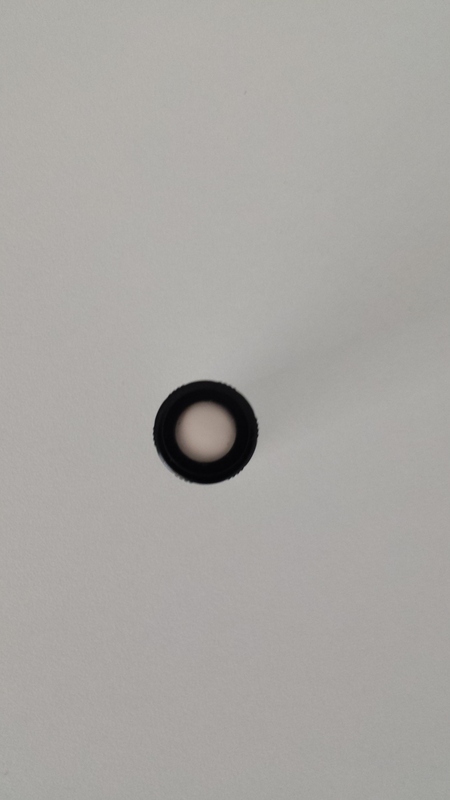 This cap is made of a material that resorbes the hole, made by the syringe, and thus keeping the content of the vial confined. However, there still are issues we’ll have to consider : The waste handling of the syringe and of the bacteria containing vial after detection of arsenic. We then had a meeting with Biosafety expert Dr. Sabrina Leuenberger in order to prepare for our trip to Bern where we will try to get an approval, by the state, of our prototype. The most interesting fact we learned is that having a project similar to ARSOlux will make it easier for us to get our project approved. Indeed, the ARSOlux project is approved by the german authorities. Thus, if we use the same containment specificities (i.e. vial) as them, we will be able to refer to their approved project and use that as a strong argument. We had also thought of different kind of vial systems like designing a pair of caps that could screw together in order to mix the content of each vial without exposing them to the environment : One vial with the bioreporter and the other one with the water sample. However, when we found out all the positive aspects of the ARSOlux vial, we decided that the later would be the best solution for a stronger argument for Bern because designing a new cap takes time and could confuse the experts because of its novelty. By making this decision, we hope to make real impact on the advancement of the project. Our new project’s direction will thus be to concentrate on getting our project approved by the Swiss authorities in Bern by addressing each legal point and making a convincing presentation. ← New team’s first post!